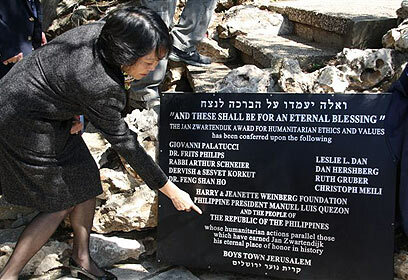 A small historic amendment was made Monday, 73 years after Philippine President Manuel Luis Quezon granted some 1,200 visas to immigrants from Europe on the eve of the Holocaust, when a marble engraved sign in his honor was revealed at the Boys Town Jerusalem campus – as an acknowledgement of the humanitarian gesture. Philippine Ambassador to Israel Petronila Garcia received a merit certificate from Josh Weston, chairman of the Boys Town Jerusalem Foundation of America, who arrived for the ceremony especially from the United States. The educational institution's small garden – named after Jan Zwartendijk, a Dutch diplomat who saved thousands of Jews during the Holocaust – is filled with signs commemorating gentiles who risked their lives to save Jews. On Monday they were joined by a sign carrying the name of Philippine President Quezon. "We are the first Asian nation to support the UN decision regarding the State of Israel's establishment. 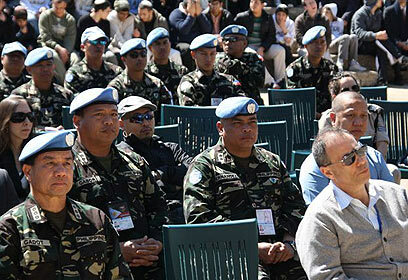 This fateful decision allowed the Jews to establish their own state and decide on the fate of their young country," the ambassador said in Hebrew, surprising the audience, which also included several Foreign Ministry representatives and some 20 UN troops from the Philippines serving on the Israel-Syria border. "They are here, defending Israel," the ambassador said, smiling. The Philippine caretaker of the wife of Alexander Linchner, who founded the place, shook the ambassador's hand after the monument was revealed. In 1939, hundreds of Manila residents took to the streets to protest the persecution of Jews in Europe after Kristallnacht. Later, Manila officially condemned the Nazis, stating that it would grant some 10,000 visas to Jewish immigrants. Ahead of World War II, about 1,200 Jews accepted the generous offer. President Quezon did not settle for that and initiated the construction of homes for the Jewish immigrants, offered them employment solutions and even let them use agricultural land from his own estate. He also founded the first synagogue in Manila, Temple Emil. A photograph of the synagogue was hung Monday at the Boys Town Jerusalem campus' main building, in the ambassador's presence. There she met 80-year-old Ruth Greenfield, who was married in the synagogue and celebrated the bar mitzvah of her two sons there. "Being a Jew is appreciating the good," said Rabbi Moshe Linchner, the dean of Boys Town Jerusalem." "Here we educate you, members of the younger generation, to acknowledge the contribution of the courageous Philippine people and a few other nations to the Jewish people. It is in man's nature to forget the good and move on, so 'don't forget' is a supreme value." The ambassador added that some 40,000 Philippine people work in Israel today. "Israeli homes have opened their doors to employment, continuing President Quezon's policy as proof of the brave relationship between the two nations," she said. This is the second site in Israel commemorating the friendship between the Israeli and Philippine people. A special sculpture was inaugurated in Rishon Lezion's Holocaust Park in 2009, describing the mutual humanitarian commitment between the two people through flags, doors and other symbols. Despite the humanitarian gesture, the Philippine rescue story has not been properly acknowledged – not even by the Yad Vashem Holocaust Museum. Yad Vashem said in response, "This is a significant act. The way the Jews were welcomed in the Philippines was, unfortunately, a rare event during those times. A Yad Vashem representative attended the Jerusalem event this week, as well as an event honoring the Philippines in Rishon Lezion last year." See all talkbacks "Saying thank you after 73 years "